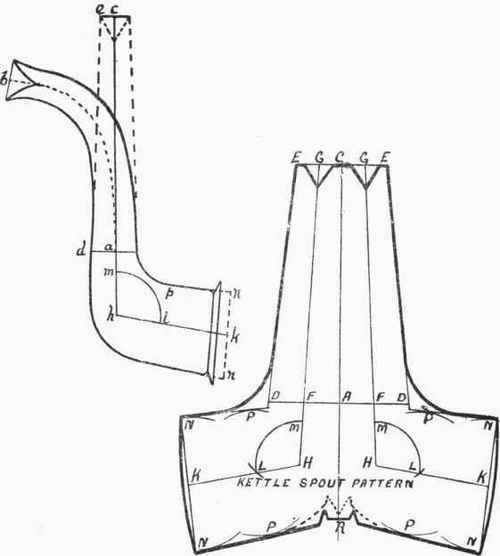 The making of a kettle spout, to the novice, is just one of those jobs for which it is somewhat difficult to find a beginning or ending without previous instruction. Spouts are usually made up from one piece of sheet metal, the marking out of its shape presenting no great difficulty. In Fig. 259 the necessary lines required for the development of the pattern are shown laid out. 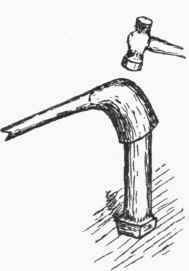 The spout is first straightened out, as it were, in imagination, by making line a c equal in length to the curve a b; the diameter at c being made the same as the spout end. The centre line A C on the pattern is cut off the same length as a c, the lines D D and E E being drawn square across, and their lengths fixed by marking off A D and C E respectively equal to three and a quarter times a d and three and a quarter times c e. The lines C E and A D are each bisected in G and F respectively, and the line G F drawn and produced to H, F H being made equal to a h. The angle F H K is next constructed by drawing an arc of the same radius and length as m l; H K then being measured off the same length as h k. The compasses are next set to a radius of a little more than one and a half times l p, and the arcs drawn as shown at P. In the same manner the arcs are drawn at points marked N. The lines N N are put into position by constructing them to make the same angle with K H as n n makes with k h. The small lug shown at R is the usual shape for sheet iron, and assists in forming the heel of the spout; the dotted lug shows a suitable shape for a copper spout. Instead of the ends N N being made straight, it will be an advantage to curve them a little, as shown on the figure. 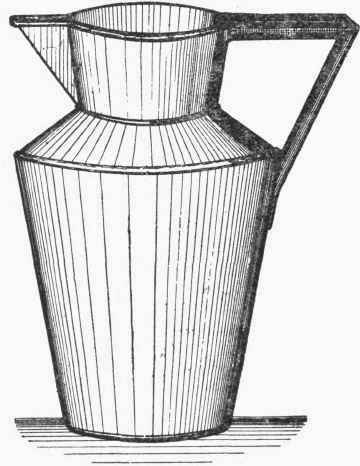 The shoulder curves are drawn to touch the lines N P and E D, and should be to a radius of about one and a half times that for the inside of the spout. 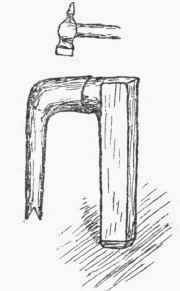 In working up, the plate is first bent a little, and then stretched on the shoulders, as shown in Fig. 260. This stretching enables the two edges of metal to come together when the tapered pipe portion is formed, as seen in Fig. 261. When the edges are lapped over a little and carefully laid down, the seam can then be brazed, as shown in Fig. 262. - to fasten to kettle body - by a hand bumping-swage, as seen in Fig. 265. 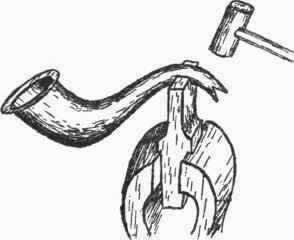 The spout is next filled with lead for the purpose of bending, the end being first stopped by twisting a piece of stout brown paper around the outside for a distance of about 2 in., and over the end. 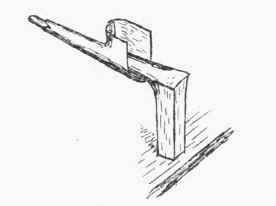 The bending is carried out as shown in Fig. 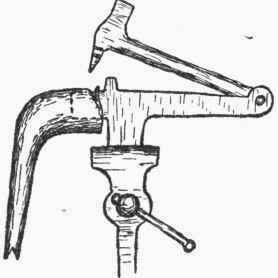 266, the tool being shaped to the diameter and bend of the spout end. 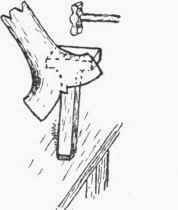 The bending must be done gradually, to avoid buckles on the underside or cracking on the top. If any buckles appear, these must be hammered out before the lead is melted from the spout. 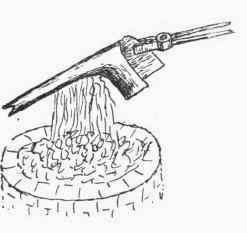 A small crack on the top of the spout can be repaired by hammering a piece of wire flat for a short distance, wrapping it around the pipe, brazing, and cleaning. After the lead is run out, the end should be rounded up and the lips opened somewhat and trimmed with a V-file. In a kettle factory, it might be mentioned, all the above operations of cutting and shaping are carried out by the aid of presses fitted with suitable dies.